The National Trout Center seeks to conserve our natural and cultural heritage of trout and their coldwater environments by engaging the public through education, practice and awareness. The National Trout Center is a great place for fishermen, families, groups and schools to visit! We were lucky to have a beautiful Saturday and guests had a great time on the National Trout Center's Fall Geology Bus Tour! A big thank you to Jeff Broberg for being our entertaining and educational guide! We would also like to give a huge thank you to Lisa Brainard, Photographer Cameron Owen, Larry Reis a Naturalist with Winneshiek County Conservation, Stephanie at the Spring Valley Laura Ingalls Wilder Site, Karst Brewing for helping and hosting us as stops on the bus tour and, of course, The Sweet Stop and Sandwich Shoppe for providing guests with great sack lunches to bring on our trip! 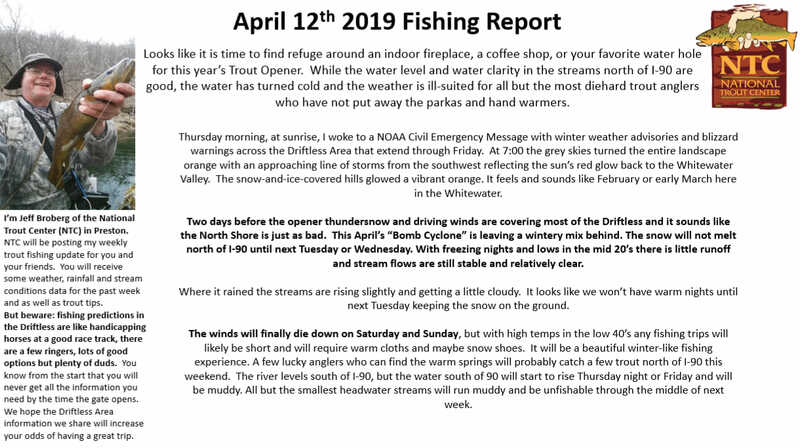 This will end our 2018 regular season at the National Trout Center. Thanks to our guests (and despite all the rain) we had a busy and successful year! Whether you came to the NTC for a special program or field trip, to hang out with Interns Henry and Bailey for Fly Tying Fridays and fly fishing workshops, or just to ask for some fishing tips, spots, and maps, it was our pleasure to help you. We look forward to the 2019 season where we hope to bring you more programs that continue our mission of educating guests about the natural resources and ecology the Driftless Area has to offer! Keep an eye out for some possible winter events! Thank you all for supporting the National Trout Center! Over 30 people participated in the Izaak Walton League of America’s “Save Our Streams” Water Quality Monitoring Training Workshop hosted by The National Trout Center! The workshop included classroom instruction on water quality challenges, physical and chemical monitoring of streams, and aquatic macroinvertebrate sampling and identification. Many participants will become our Master Stream Technicians for our Whitewater Stream Team! We would like to thank everyone for coming to learn how to monitor the health of their local streams! Thanks to two neighboring landowners for allowing a crew of Win-Cres TU Chapter members to use the Brush Hog to mow an angler's path along Rush Creek this morning! Anglers won't have to fight so much with the parsnip, nettles, and ragweed for the last few weeks of the trout season above and below the Ahrensfeldt Creek access along County Highway 25. Trout streams. Southeast Minnesota. Be there. We’re into the catch-and-release season for trout streams in Houston, Fillmore, Mower, Dodge, Olmsted, Winona, Wabasha and Goodhue counties that lasts through Monday, Oct. 15. It’s a great way to spend a fall day! 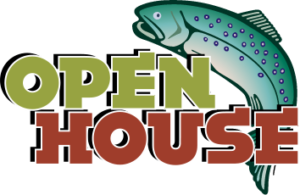 Stop by the National Trout Center for our Opening Event on Saturday, April 27th between 12:30 pm and 3:00 pm! We will have hot dogs, chips, cookies, other refreshments, door prizes, and crafts for kids! Listen to a representative from the DNR Lanesboro Fish Hatchery talk about local trout populations! Watch one of our experts tie a fly and try your hand at tying your own! Share stories with local anglers! All new Members will receive a free T-shirt!